Imagine you work your whole life towards one goal. You mortgage your relationships, career, free time, and future plans for just one attempt. But, between you and destiny sits another pair who also sacrificed beyond reason. They’re beating you and time and distance is running out. What would you do? Welcome to the world of Olympic Rower, Sara Hendershot. 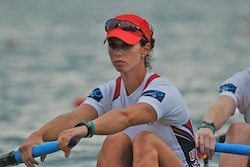 In the Olympic Rowing Trials, Hendershot and partner Sarah Zelenka were down two boat lengths 750 meters from the finish. Sara, as the bow seat rower, looked around and told her partner, Sarah, to pick up the cadence. (I imagine this exchange with profound intensity). In the rowing equivalent of a bottom-of-the-ninth homer Team Sara(h) emptied their tanks, overtook that final boat, and won the Olympic Trials for women’ pairs by three seconds! They won, next stop – London. Sara came to the sport at 15. Already a swimmer with endurance, her parents encouraged her to give it a try in high school. There, she juggled swimming, rowing, and soccer. She fell in love with the sport and had an exceptional prep career at Simsbury High School in Connecticut. From there, she rowed in the Ivy League against some of America’s finest teams with Princeton University. Going into London, the women’s pair field promises to be fast and competitive. In the next 37 days, she and partner Zelenka will focus on starts to get out of the blocks quicker and place less reliance on their finishing surge. One rowing strategy is to have five initial surge strokes to accelerate the boat from the start line. Then, a series of high strokes will get the boat up to speed. From there it becomes a war of pacing strategy, aerobic attrition, and preservation. While the Dutch are famous for outright sprints, other teams will lie in wait and negative split with a powerful finish. The challenge of practice is to find the equilibrium between applying pressure, recovering, and over-committing. That equates to a fast start, a hard middle-pace, and a lung-busting gold medal finish. The roles are slightly different for the bow seat and the stroke seat. I sit in the bow and my partner sits in stroke. Her job is to completely set the rhythm, stay focused, look forward, and make sure the boat is going straight. She has steering attached to her toe. My job is to keep the race plan going to match her and look out the boat occasionally, see where we are, and adjust the plan. In England, rowing is one of the country’s favorite sports. It promises to have an avid following especially for British rowers. “Rowing is going to be amazing in London because it is such a high profile sport there. It’s going to be a big center of attention. We don’t really get that in the US – I’m excited for that. We’re going to have a plan for the race. The majority of the plan is to go really hard! Focus our nerves.” Imagine playing basketball in front of half-filled high school gyms, then going to play in a sold-out, rabid Boston Garden. That’s what she is going to experience. We’re just going to soak it up, enjoy the moment, we love racing, we love pressure. We love being the underdogs and being that we are a little bit inexperienced and we thrive on being naïve and trying to do whatever we can out there. Just see what you can do. It’s a test against yourself. If you empty the tank , you can be proud whether or not you come out with a medal. Well, we’re ALL proud of you Sara. Good luck to you and Sarah in London! You can keep up with all of Sara’s activities, by following her on Twitter. Next articleWill iPhone Availability Spur More Carrier Competition? @RickyChapps Great interview. !Holy moly 21-min video? We were allowed 30 secs only with our submission via http://t.co/xp2iIVof. Thanks Tommy for your support! @kimongsk we’d love to talk with you about your Olympic experience as well Kim. When can we interview YOU? I’ll be rooting for her! Great interview. @jameshicks Hi there, but I’m not the Olympic hopeful. My husband @JosiahCyclist is. @kimongsk you did the Samsung video – that’s why we want to talk to you. If your husband is available too – then nice!! @INFOtainNews It would be an honour to be interviewed by you. How can we help? Pls DM me. What is WordPress – Really ?